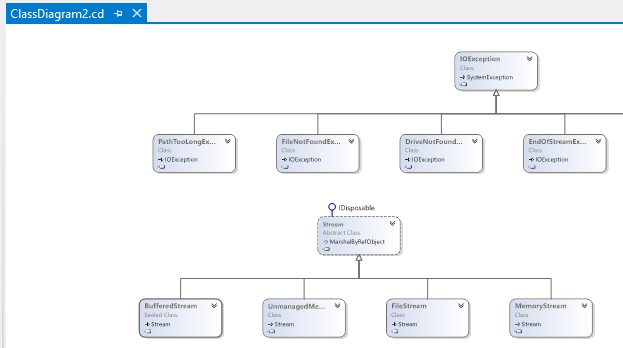 You can use the class diagram to follow the inheritance chain for any class currently in the diagram, moving up to the class’ base class or down to the classes that derive from the class. 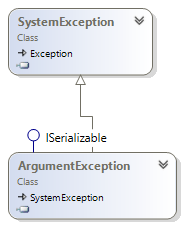 For example, let’s say that you’ve dragged the ArgumentException class onto a class diagram, from the Class View. You can add the base class of ArgumentException to the diagram by right-clicking on the class and selecting Show Base Class. The base class will now be shown on the diagram. 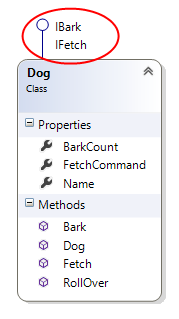 You can also show all derived classes of a particular class by right-clicking on the class and selecting Show Derived Classes. 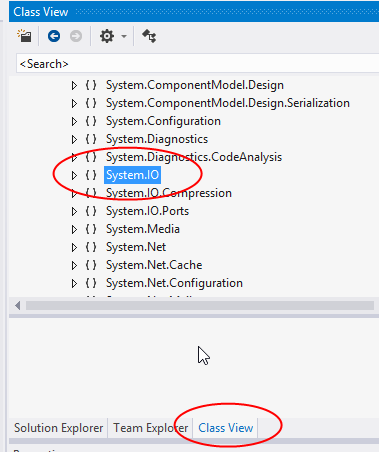 Using this technique, you can easily browse through the classes in the .NET Framework. 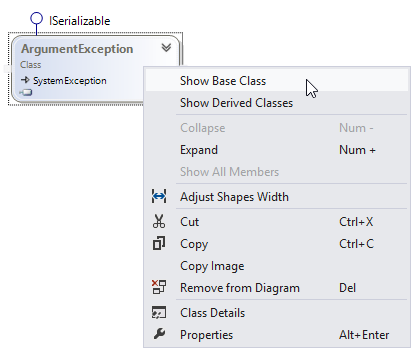 If you create a class diagram that contains types found in assemblies that your project references, and then you leave the class diagram open when you close Visual Studio, you may see some errors in the class diagram when you re-open the solution. 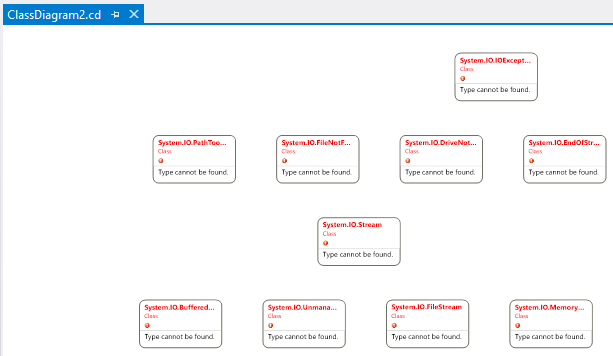 The types on the class diagram may all be drawn in red and report “Type cannot be found”. You can fix this problem by just closing and re-opening the class diagram. The diagram will re-discover the information for the types. 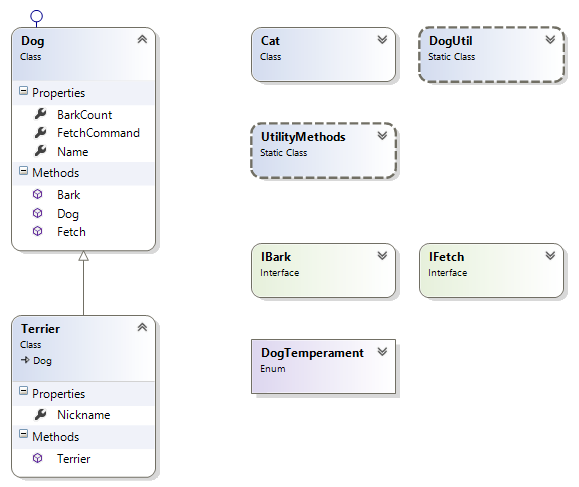 You typically create a class diagram in a project for the custom types that you’ve created in that project. 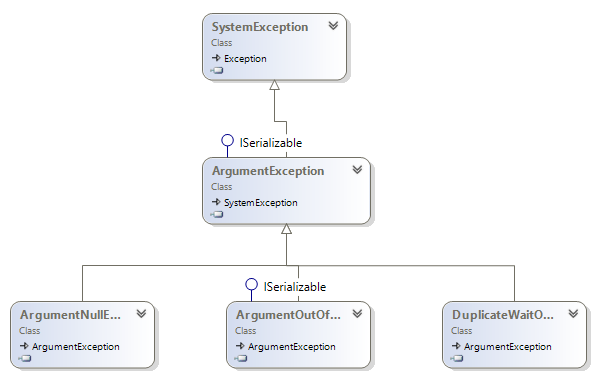 You can also include types on a class diagram that come from assemblies that your project references, including the .NET Framework itself. Add a new class diagram to the project. (Right-click on project, select Add, New Item, then select Class Diagram). Switch from Solution Explorer to Class View and expand Project References until you find a namespace or type that you want to look at. 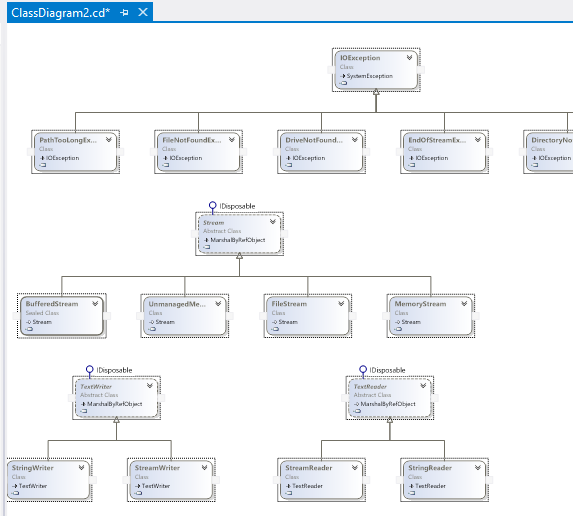 Left-click and drag the selected namespace onto the class diagram. 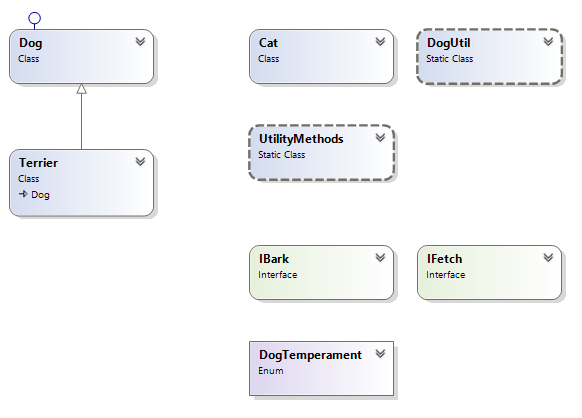 All types from that namespace will show up on the class diagram (initially zoomed out). You can zoom in and expand types to see more details. You can use the Class Details window to easily create or modify a type’s members. 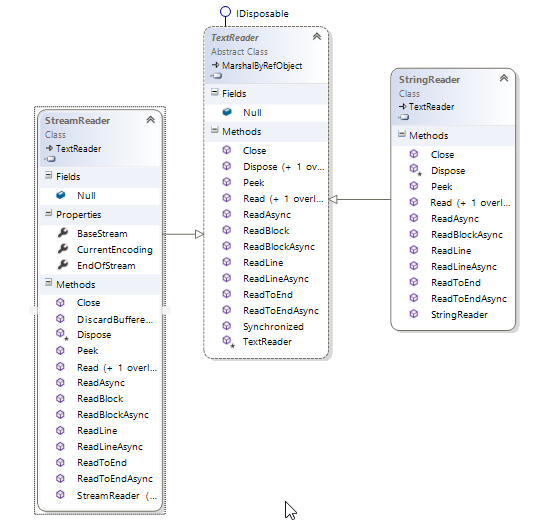 To open the Class Details window, start by opening a class diagram. 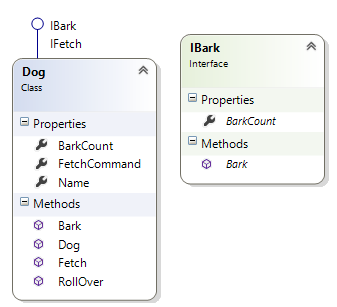 If the Class Details window does not appear, right click on one of the types in the class diagram and select Class Details. Once the Class Details window opens, you’ll see a full list of the type’s members (e.g. 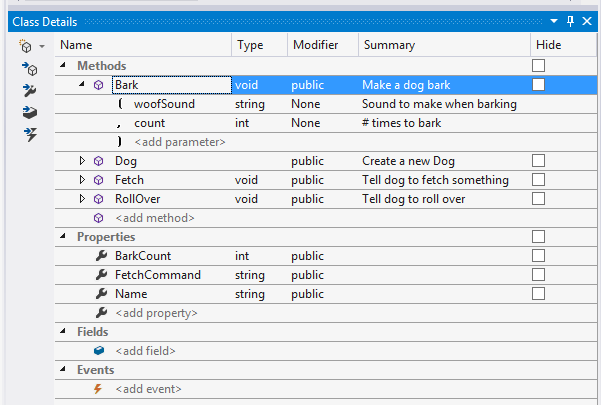 methods, properties, fields and events). The columns of the Class Details window shows some basic information about each member. You can also expand methods to see parameters of the method. To add new members, just start typing the name of the new member in the appropriate group. 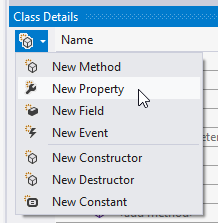 For example, to add a new property, left-click on <add property> and start typing the name of the property. You can also add members by clicking on the icon in the upper left corner of the window. 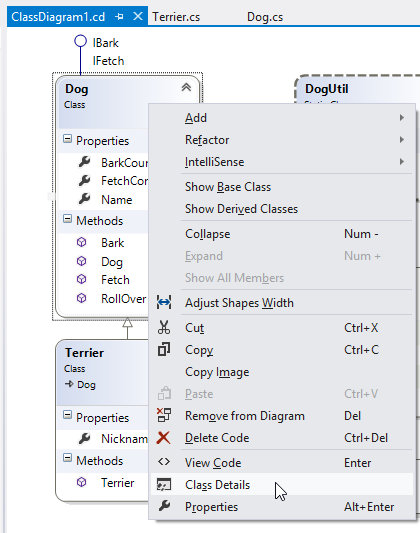 In addition to adding new types from a class diagram within Visual Studio, you can also add members to existing types. In the class diagram, you right-click the top area of the class and then click Add in the popup menu. You’ll see a list of the different class members that you can add. 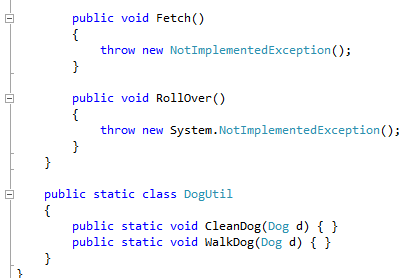 For example, we can add a RollOver method to the Dog class. 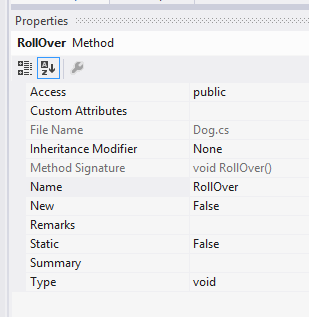 After selecting Method from the menu, a new method shows up in the list of methods for the class. 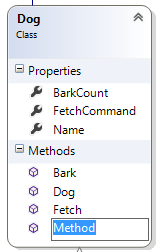 After you name the new method, different attributes of the method will show up in the Properties window on the right side of the Visual Studio workspace. You can then make changes to the method by changing its properties. 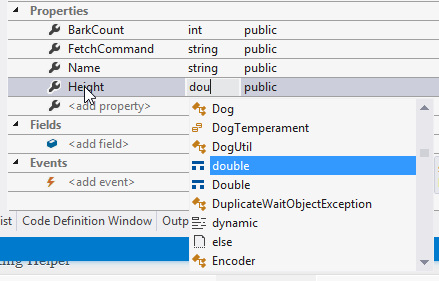 You can of course go view or edit the new method in the code editor window.